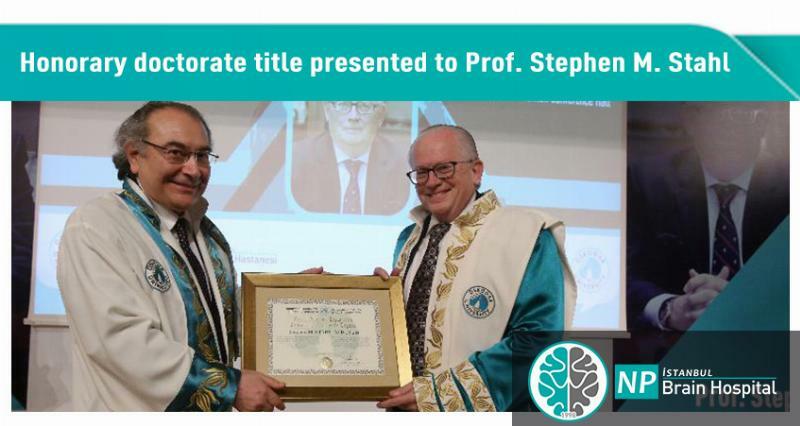 Prof. Stephen M. Stahl, Professor of Psychiatry, known for his academic work was awarded the title of "Honorary Doctorate" by Üsküdar University. Prof. Nevzat Tarhan presented robe and diploma to Prof. Stephen M. Stahl. Prof. Stephen M. Stahl thanked while stating that he is honored and that he is very impressed with Üsküdar University and practice partner NPİSTANBUL Brain Hospital. Prof. Stephen Stahl received “Honorary Doctorate” title by Üsküdar University due to his academic studies and accomplishments in the field of neurology, psychiatry and psychopharmacology, as well as his scientific publications worldwide. Prof. Nevzat Tarhan mentioned that this day holds a historical importance for him and stated that Prof. Stahl is an idol in psychiatry, especially psychopharmacology field. Üsküdar University was held in Nermin Tarhan Conference Hall. The opening speeches of the ceremony were made by Prof. Üsküdar University Rector. Dr. Nevzat Tarhan and Üsküdar University Manager of Addiction Practice and Research Center and NPİSTANBUL Brain Hospital Psychiatry Expert Prof. Nesrin Dilbaz. Prof. Nevzat Tarhan stated that that day has a historic importance for him and mentioned that Prof. Stephen Stahl is an idol in psychiatry, especially in psychopharmacology. Üsküdar University, founded in 2011, said that together with the newly opened medical faculty, there are about 16 thousand students in five faculties, five institutes and one college. Prof. Tarhan also stated that they have received accreditation today for NPİSTANBUL Brain Hospital and that they have worked for this together for two years. Prof. Tarhan said that they have attended G20 as Neuroscience (N) 2 for three years as Üsküdar University, attended the meetings in Antalya (2015), China (2016) and Hamburg, Germany (2017) and will attend the meeting in Argentine this year. Tarhan, "Here we are discussing the definition of neuroscience policies. Why did they call us in G20; our R & D focus was on neuroscience. Focus on a topic and deepen it. One of the reasons why we have to take this accreditation is that I think it is especially emphasized." Prof. Nevzat Tarhan, “Mr. Stahl has some features that are very influential new generations. He is a clinician that is encouraged by the difficulty. He feels the need to find new ways to find new ways while struggling hard because of his desire for difficulty. I think Stahl is a good role model for younger generations. He makes new diagnostic and treatment options clear. He is a clinician who asks, "What can I do better?” His works are stimulating, his works are inspirational. Prof. Tarhan added that Prof. Stahl was awarded an honorary doctorate degree by Üsküdar University because of his works and studies. Prof. Nesrin Dilbaz shared that when psychiatry specialists start their education, the first book they read was Prof. Dr. Stahl's books. She stated that pharmacology was not a subject that was pleasurable but psychopharmacology has really become one of our favorite areas due to his books and over the years, he established a large institute in the US, the Neuroscience Institute in order to take part in drug research and undertake the education of many psychiatrists in America. He conducted many publications and lots of research. He is a scientist that enlightens me. We are together for 6 days and even during this time, I have obtained a newer vision. We were in the hospital earlier. I would like to mention one more time that I am very much proud with our hospital and university. The reason is that when Prof. Stahl saw the opportunities we have in the hospital, he asked “Are you aware how lucky you are?” My answer was that maybe we forget how lucky we are when we are in it too long and we forget. A person like you should come here more often and remind us. She said, “We have had to advise that we should do more scientific work, and that we have to devote our time to scientific work as much as we can.” She shared that Prof. Stahl mentioned that the hospital has opportunities that do not even exist in his hospital and she continued, “In short, he is a very good researcher, a very good psychiatrist, a very good clinician, a trainer and a perfect person. I am proud to welcome him here as my close friend and to make him understand us better. I am proud of our hospital and our university. After showing a biopic made in honor of Prof. Stephen M. Stahl, Üsküdar University Institute of Social Sciences Assoc. Prof. Gökben Hızlı Sayar read the reason for presenting an honorary doctorate. Prof. Stephen Stahl received “Honorary Doctorate” title by Üsküdar University due to his academic studies and accomplishments in the field of neurology, psychiatry and psychopharmacology, as well as his scientific publications worldwide. After presenting the reason behind the doctorate, an honorary doctorate presentation ceremony was conducted. Prof. Nevzat Tarhan presented robe and diploma to Prof. Stephen M. Stahl. Prof. Stephen M. Stahl stated the following in his speech: “I am honored and impressed. I had great time in this country. This is my second visit in Turkey. My first visit was 14 years ago. I went to Antalya, İzmir, Ankara and now I am in İstanbul. Prof. Stephen M. Stahl thanked Üsküdar University for the honorary doctorate title and said, “Welcome to Psychiatry. You can make a difference.” After Prof. Stephen M. Stahl’s thank you speech, a family photo was taken and the ceremony was finalized. Prof. Stephen Stahl visited Üsküdar University’s application partner NPİSTANBUL Brain Hospital before the ceremony. Prof. Nesrin Dilbaz and the team of addiction team accompanied Prof. Stahl. Prof. Stahl visited the floors, neuromodulation center and occupational therapy center. Prof. Stahl mentioned that he is especially fascinated with the Deep TMU and TMU in neuromodulation center. Prof. Stahl stated, “I can say that your hospital is really good, spectacular. I congratulate you for this. It is one of the best I have seen.” Prof. Stahl has also exchanged ideas about treatment methods with psychiatric specialists in the hospital.